Interior of a triangle is an area which lies with-in the boundaries of a triangle. Interior of a triangle is an area which lies with-in the three sides of a triangle. An area with-in the boundaries or perimeter of a triangle is known as interior of a triangle. 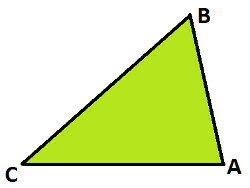 Area highlighted in green is referred to as Interior of triangle ABC. 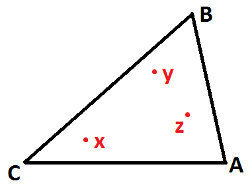 Points x, y & z lies in the interior of triangle ABC.